Guild Players | Will You Take This Woman? 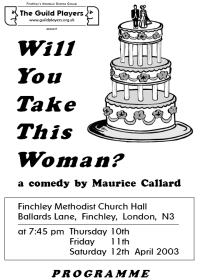 Herbert & Pauline Farson are keen that their eldest daughter Fiona should marry her new boyfriend Gerald Dunjon, but he seems to need some persuasion to pop the question. Six months ago she was due to wed Johnny Spinet, but he failed to show up at the church. Their youngest daughter Jenny, an enthusiastic but hopeless cook, has been talent spotted by Derek Colbert, the film producer. However, they are dubious about his motives. The living room of the Farson's house in a south-coast town. It is early August in the late 1950s.